Company Name: NISHIYAMA SHUZOJO CO., LTD.
Nishiyama Brewing has produced sake from locally grown rice and natural water for over 160 years. Its facility, in Hyogo Prefecture, is registered as a tangible cultural asset in Japan. 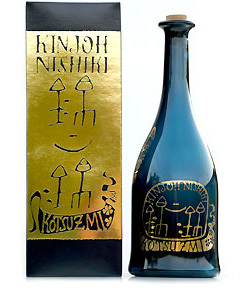 Its most famous sake is “Kotsuzumi” which was named by Kyoshi Takahama, a famous Japanese haiku poet. We are particular about sake rice- we use only rice which is certified by the National Federation of Agricultural Co-operative Associations. 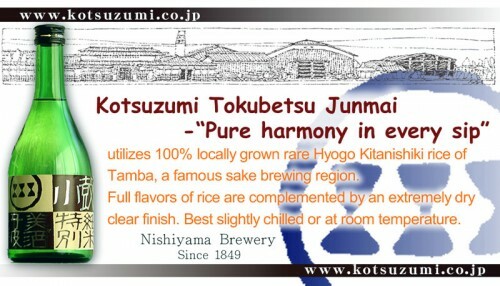 “Kotsuzumi” has a wonderful soft taste and rice flavor, and has won gold awards many times in sake contests.